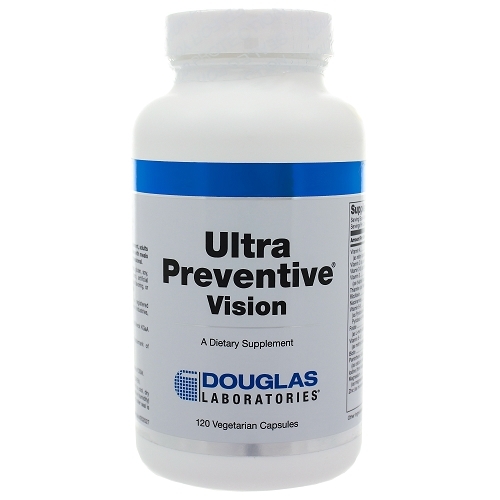 Ultra Preventive® Vision is a multivitamin/mineral formula specially designed to support ocular health with specific phytonutrients and carotenoids.† Included in this formula is a lutein to zeaxanthin ratio of 3:1, which has been shown in research to contribute to a healthy macula and vision.† Additionally, nutrients such as vitamin C, alpha-lipoic acid, green tea and resveratrol provide antioxidant activity to the eyes.† Methylated B vitamins in the form of 5-MTHF, methylcobalamin, P-5-P and benfotiamine allow for maximum bioavailability of these nutrients. 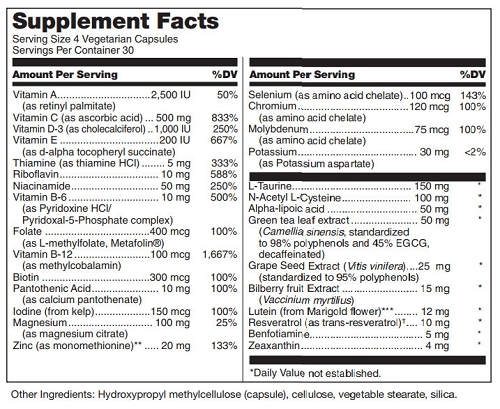 Other Ingredients: Hydroxypropyl methylcellulose (capsules), cellulose, vegetable stearate, silica. For optimal storage conditions in a cool, dry place. As a dietary supplement, adults take 4 capsules daily in divided doses with meals or as directed by your healthcare professional.